There are two trends happening in society today the public perceptions of which seem at odds to me. 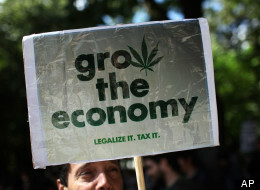 One is the appearance and increasing use of electronic cigarrettes, or e-cigs, which is portrayed in the media as bad and in need of regulation if not outright ban, and the other is the increasing de-criminalization and indeed in some cases legalization of marijuana which is generally portrayed positively or as a simple matter of personal freedom. I must say that I do not understand the crusade against electronic cigarettes. Anti smoking zealots have argued that the adverse health effects of smoking, not just for the smoker but for anyone in the vicinity via second-hand smoke (and currently for the entire environment because discarded cigarette butts are poisonous!) justified their vendetta against a legal product. And the public at large has generally bought into this because no one likes the smell of cigarette smoke. However…the advent of electronic cigarettes adresses every one of these issues – healthier for the smoker, no second hand smoke and no butts on the sidewalk. Your dog is safe! The anti smokers should be hailing this as a win-win: Smokers get to smoke and no threats to non-smokers! But that is not the case. Smoking of electronic cigarettes, or “vaping” must be prohibited just like regular smoking because it looks like regular smoking. And don’t forget the children. Children might see someone vaping and try it themselves and then move on to the hard stuff – real cigarettes! Another argument is that e-cigs contain nicotine, just like real cigarettes. But there is no nicotine in the vapor for second hand effect, only the user is exposed. Besides – other antismoking aids such as nicotine gum and patches also contain nicotine. And both of these are arguably less safe for children as they could be extremely harmful if accidentally ingested by a child. And finally, there is the uncertainty and over abundance of caution factor: E-cigs might be bad and that’s a risk we can’t take. Now for the weed thing. First, I am not a weed prude. In my lifetime I have probably lost more weed in my couch cushions than any thirty something hipster today will ever smoke. But I don’t smoke it any more and have no desire to. Been there, done that, got the t-shirt. A very expensive t-shirt at that considering the money spent and time squandered on the habit. But if you want to smoke it, knock yourself out. 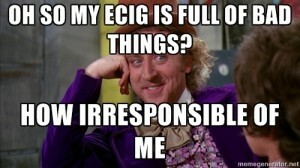 Kind of like my attitude toward cigarettes real and electronic. But there is a potential danger to marijuana smokers posed simply by the act of smoking a substance. Marijuana contains no nicotine that I am aware of, but the absorption of nicotine is not the only danger of smoking, inhaling smoke of any kind is traumatic to the lungs and cardio-vascular system in general. This is never mentioned in reporting on this subject. Folks who are against liberalization of marijuana laws argue that it is a gateway drug that will lead users onto harder drugs. Anectdotally I have seen this to be true, though not universally. Such fears are rebutted with assertions that there is no evidence to support that stance. So the risk that smoking pot might be harmful for some people is a risk we can afford to take and abundance of caution is not justified in this case. But consider this – in Colorado, the first state to legalize recreational pot use, the nascent pot industry is looking for ways to expand the customer base and to entice non users to try marijuana. Granted, they seem to be sensitive about marketing to a youth audience but I don’t think that you can argue that marketing of cigarettes (or liquor for that matter) specifically aimed at adult audiences will influence children and that similar marijuana marketing will not. I guess I wonder why Vaping isn’t hailed as a breakthrough for public health and that marijuana legalization isn’t viewed with a little more caution or skepticism. Perhaps I’m crazy – or is everyone else? Or I’m straight and everyone else is stoned? Whatever. Personally, my attitude is live and let live. You want to smoke? Spark one up. You want to vape? Have at it.